The List of World Heritage Sites in China is a group of places chosen by UNESCO, the United Nations Educational, Scientific and Cultural Organization. 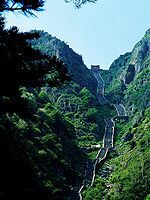 China agreed to take part in the World Heritage Convention in 1985. Legend: Cultural Heritage site; Natural Heritage site; Mixed site Lua error in Module:Location_map/multi at line 27: Unable to find the specified location map definition: "Module:Location map/data/China" does not exist. There are 43 WHS places in China. The Tentative List consists of sites which have been nominated. The evaluation process is not yet completed..
↑ UNESCO, "Constitution"; retrieved 2012-7-18. ↑ UNESCO, "States Parties: Ratification Status"; retrieved 2012-7-18. ↑ UNESCO, "China"; retrieved 2012-7-18. ↑ Centre, UNESCO World Heritage. "UNESCO World Heritage Centre - Tentative Lists". whc.unesco.org. Retrieved 2017-06-16. This page was last changed on 31 May 2018, at 10:45.